We’re pleased to reach a large audience of German speaking TV viewers,” said Michael DePietro, CEO of Karate Combat. “We’re confident they’ll be hooked on Karate Combat's full-contact action. 7Sports, the sport business unit of ProSiebenSat.1, announced an exclusive agreement with Karate Combat to bring its full contact karate competitions free-to-air and online to audiences on ProSieben MAXX and ran FIGHTING across Germany, Switzerland and Austria. 7Sports belongs to the leading German entertainment player ProSiebenSat.1 Group. Eight events from all over the world will air throughout 2019, live, near-live or on demand on the dedicated combat sports digital platform ran FIGHTING. Selected events will be shown free-to-air on TV channel ProSieben MAXX. Karate Combat: One World Center will celebrate its premiere in German-language Free TV on March 24th at 10:00 p.m. CET (GMT +1). 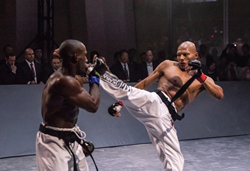 The new martial arts league is the first mainstream, professional full contact league and has received international praise since its launch last April. Competitions in Budapest, Athens, Miami, New York City and Hollywood were viewed by millions live, with many more watching replays. A new championship structure, leading to the awarding of the Golden Belt in each weight class has riveted fans as returning fighters take on new challengers. Karate Combat’s distribution model, working with prestigious partners in linear and digital television, has earned it praise from The New York Times, which compares the presentation to video game Street Fighter come to life, and TechCrunch, which called it the future of the sports business. In 2019, Karate Combat will broadcast events live from Japan, China, Brazil, Spain, France, Italy, Latvia and the U.S.
ran FIGHTING boasts Germany’s largest combat sports archive, including ONE Championship and German Mixed-Martial-Arts Chamionship (GMC), all available through the ran FIGHTING BLACK PASS subscription. For more information, visit http://www.karate.com and http://www.ranFIGHTING.de. Karate Combat is a premier Karate brand which operates a professional full contact karate league, sports equipment business, and worldwide Dojo network. The Company seeks to evolve the traditional sport of Karate via KARATE.com, the World’s Gateway to Karate, and branded mobile apps. The firm is headquartered in New York City with satellite offices in Calabasas, CA and Budapest. For more information visit http://www.karate.com. ProSiebenSat.1 Group’s entire innovative and digital sports portfolio is bundled under 7Sports. The umbrella brand for the media group’s sports business focuses on the establishment of digital sports platforms, the expansion and 360° marketing strength of exclusive sports productions, the management of young and professional athletes and premium sport events. 7Sports benefits from ProSiebenSat.1 Group’s many years of experience with popular sports brands and the successful acquisition of new platforms such as Sportdeutschland.TV and 90min. This enables ideal synergies between the individual sports segments. With ProSiebenSat.1’s marketing power in the sports sector, 7Sports is one of the most profitable platforms for sports-oriented advertisers, cooperation partners, co-investors and professional athletes in the German-speaking region. 7Sports is a ProSiebenSat.1 Sports GmbH brand. ran FIGHTING offers the entire world of combat sports – live and on-demand. Via Smartphones, computers or Smart TV customers get access to Germany's largest martial arts archive. Included in the offer is the best of e.g. mixed martial arts, boxing, kickboxing or karate by national and international top performers. ran FIGHTING is available in Germany, Austria and Swiss. 7Sports, the sport business unit of ProSiebenSat.1 Media SE, is the provider of ran FIGHTING.